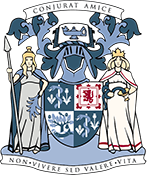 On 29th October 1732, a fire broke out in a house in Glasgow, next door to the home of one John Colquhoun, Clerk of the Faculty of Physicians and Surgeons of Glasgow. The fire spread quickly to Colquhoun’s house and many of Colquhoun’s possessions were burnt to a crisp. 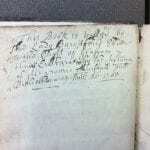 Also in Colquhoun’s possession at this time, and thus sadly lost to the fire, was the Faculty’s second minute book, covering the period 1688 to 1732. This leaves us today with a frustrating gap in the early records of the Faculty. The lack of reliable records for the years between 1688 and 1733 makes it especially difficult to piece together the early history of the Faculty Library. The Library was founded in 1698, shortly after the first Faculty Hall was erected near the Trongate. We know, largely thanks to the efforts of the 19th century librarian Alexander Duncan, that the nucleus of the library was formed by donations from Faculty members and their well-to-do patients and friends. 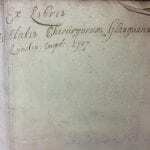 In Duncan’s book, Memorials of the Faculty (1896), he transcribes a manuscript listing “the names of such worthie persons as have gifted books to the Chierurgions Librarie in Glasgow”. Although Duncan notes that “many of [the books] are still on the shelves,” he does not provide a list of their titles, so it is difficult to know what the size and scope of the Library was like in its early years. This is where our ongoing ESTC matching project comes in. As part of our work to match our current holdings to the records on the English Short Title Catalogue, library staff and volunteers have been closely scrutinising many of the pre-1800 titles in our collections. In the last month we have started looking at books from the Lister Room, and have rediscovered some important inscriptions indicating early donations to and purchases by the Faculty Library. The title page of Robert Bayfield’s “Exercitationes anatomicæ in varias regiones humani corporis”, with the autograph of Dr Peter Patoun. 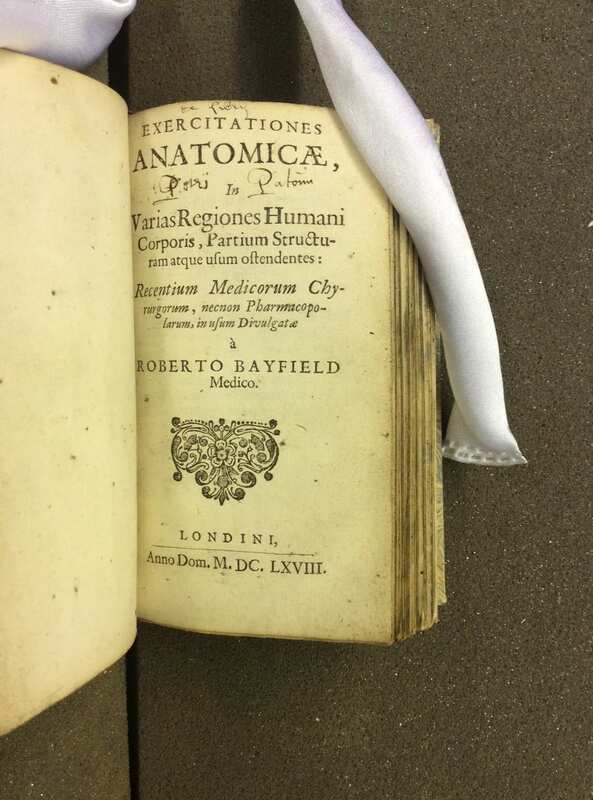 In one diminutive volume, containing the first and second editions of Robert Bayfield’s Exercitationes anatomicae in varias regiones humani corporis (ESTC R31574 and R23670, respectively), we find an “Ex Libris” inscription dated 1687, belonging to Dr Peter Patoun. Dr Patoun (sometimes spelled “Patoune” or “Paton”) was a Glaswegian physician who graduated with an M.D. from Leiden in 1691 and became, according to Duncan, “one of the leading physicians in Glasgow”. He was Praeses (i.e. President) of the Faculty between 1709 and 1710, and is known to have donated a number of books to both the Faculty Library and the Library of the University of Glasgow. Although this is the first of his books we have identified here, a list of his donations to the university appears in volume 3 of Munimenta Alme Universitatis Glasguensis (1854, p.440). Not all the donations to the library were from Faculty members. 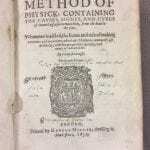 Our copy of the 7th edition of Philip Barrough’s The method of physick (ESTC S101230) features this fairly detailed inscription: “This book is gifted by the Lady Barrowfield Elder to the Chyrs of Glasgow – the Library, by the influence of Mr Henry Marshall … Bibliothecarius, Nov. 26 1705”. Both Lady Barrowfield and Mr Henry Marshall appear in the list of “worthie persons” to have donated books to the library, the latter listed as “Mr. Henrie Marshall, Chyrurgeon Apothecar”. According to the list, Marshall also persuaded the Earl of Wigton to donate some books, although we have yet to identify these. Details of the purchase of Morison’s Herbal, one of the Faculty’s earliest library acquisitions. These donations formed the nucleus of the library, and eventually the Faculty began buying books to further expand the collection. On the front flyleaf of Plantarum historiae universalis Oxoniensis pars tertia (ESTC R8391), we find this inscription, “Ex Libris Facultatis Chirurgorum Glasguensium, Londin: Empt. 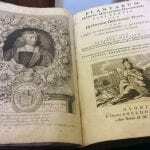 1707”, marking out the 3rd volume of Robert Morison’s herbal as one of the earliest purchases for the Faculty Library. We’ve only just started matching Lister Room items to ESTC, so we are keeping our fingers crossed that more evidence about the Library’s early life is waiting to be uncovered.